The new console has 61 keys and a maple and walnut pedal board, AGO standard style in a style and finish to match other interior sanctuary oak furnishings. Tilt tabs activate the various ranks of pipes all of which are expressive except the unenclosed trumpet and bourdon of the pedal organ. A microprocessor connects the console to the organ via fiber-optics. A ten-level piston memory, midi-interface and expression pedal complete its versatility. The entire organ, with the exception of the Great 8’ Principal and certain large bass pipes of the Pedal, is enclosed and expressive. 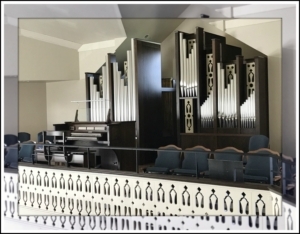 An organist bench and appropriate lighting for the full organ and pedalboard are included.